P.S. Why does every dessert on Pinterest contain a cake with buttercream, cheesecake and also happened to be stuffed with some crazy salted caramel filling. There’s only so much you can put in a dessert. I would like to tell the world to please stop stuffing banana bread with whatever new flavor Oreo is in stores this week. Okay, rant over. Back to cookies. Most nights after dinner I find myself in a constant dessert dilemma aka CDD; it’s the urge to have a late night sweet, but also the want for it to be made with ingredients I can feel good about eating. Indulgences are fine every once in awhile, but most of the time, I want to put feel-good food in my body. So… that’s why I love baking at home! I can make food with the ingredients I already have in my pantry. 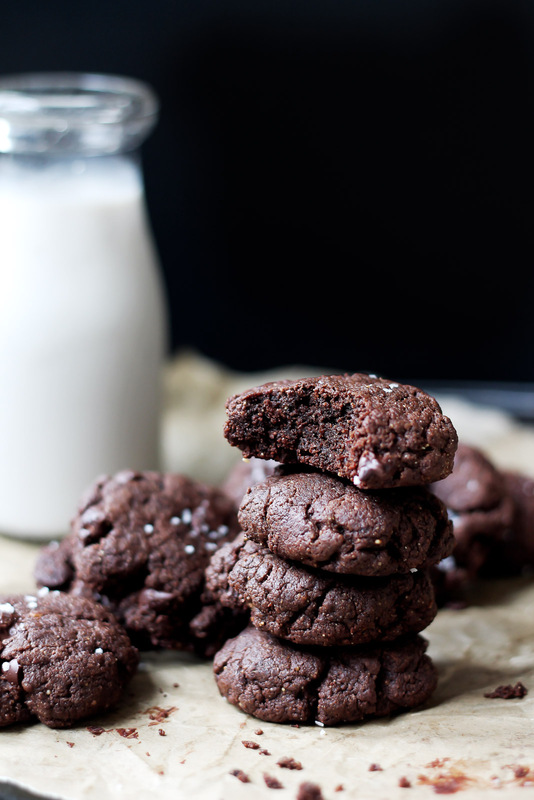 When I baked these chocolate almond butter cookies last week, I was astounded by how delicious they were. They legit taste like a fudge brownie aka damn good and fudgy. I call them every day cookies because they only take 15 minutes to make and taste like they came straight from the bakery. 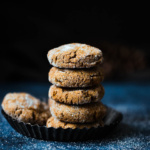 And no, they don’t have a strong almond butter taste; this is especially good for those of you who despise almond butter because all you taste with these cookies is rich chocolate fudge flavor. When you eventually make these cookies, I highly recommend using an almond butter that contains just almonds (or almonds & salt!). You can even use homemade almond butter if you’d like! I like to finish these cookies off with sprinkle a little fancy sea salt over the tops. It makes them look like they just came from a bakery. I know you guys are going to LOVE these! They are especially good with a cup of coffee in the afternoon, or a glass of vanilla almond milk to dunk them in. Enjoy! xo. 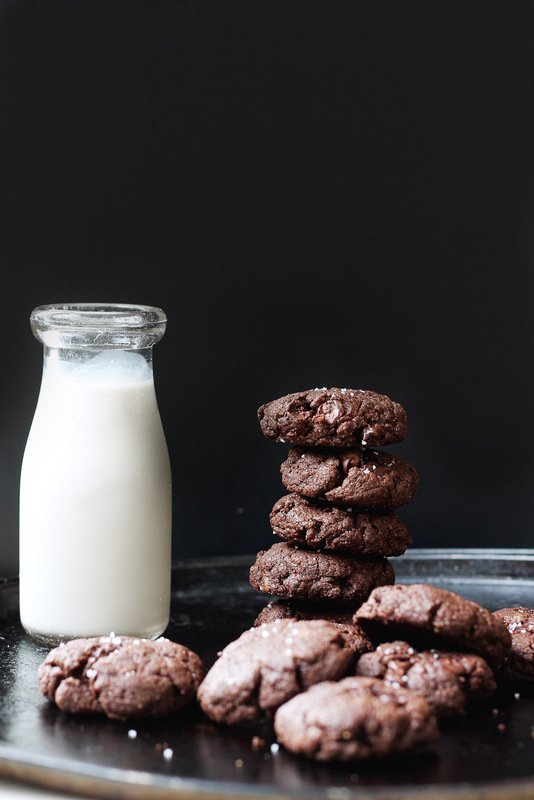 Delicious brownie-like flourless chocolate almond butter cookies made with a handful of simple, healthy ingredients. They only take 15 minutes to whip up! In a medium bowl, combine almond butter, coconut oil, sugar, vanilla, egg, cocoa powder, baking soda and salt; mix until smooth and well combined. Fold in chocolate chips. Roll dough into large balls (about 2 tablespoons) and place on baking sheet. Slightly flatten each dough ball with the palm of your hand. Bake for 7-8 minutes or until edges are set. Do not overbake! If you are allergy to almond butter, you can sub cashew butter. Peanut butter is good too! If you have a nut allergy, try subbing sunflower seed butter. 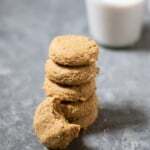 To make these vegan: I think you could try a flax egg and the results would still be delicious! Creamy Roasted Butternut Squash Pasta with Peas (vegan & gluten free!) 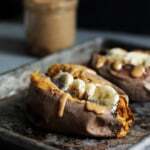 22 Delicious Pumpkin Recipes! 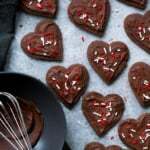 90 Responses to "Flourless Paleo Chocolate Almond Butter Cookies"
Yum!!! They look sooo delicious! Amazing! Need to make these ASAP! Could you substitute honey for the coconut sugar? I haven’t tested it but I would recommend reducing to 1/4 or 1/3 cup if you do try it. I just made it with a half cup of honey and they turned out so fudgey and perfect! I made them with two ripe bananas instead of the sugar and they are delicious. I also add pecans and coconut flakes! Do they cook at the end on the wire rack in the oven? If so how long? Thanks! love this! do you think it would still taste good if i subbed the coconut oil for olive oil or another oil? Is roasted almond butter ok, or is it better with raw? Made your pumpkin paleo brownies last night…delicious! So so happy you liked the brownies. These should be made with roasted almond butter because it enhances the flavor. These look delicious! 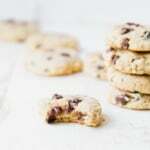 I need to pick up some chocolate chips so that I can make these immediately!! Oh my, woah! I will probably sub the coconut sugar for organic brown sugar at a 1:1 ratio. Do you think that would work out alright? These are the best cookies ever!! I used only 1/4 cup coconut sugar, since it was all I had. Making more this weekend. 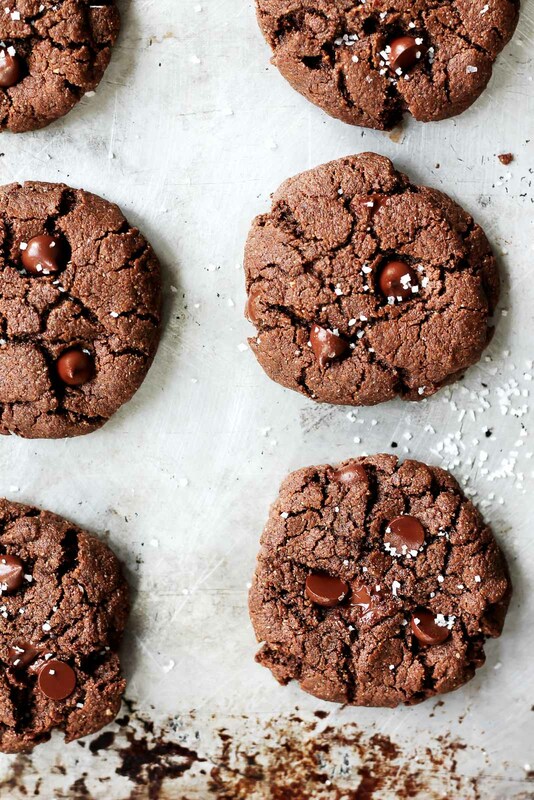 Always looking for new cookie recipes for the holidays – this one is topping the charts! These were absolutely delicious! I’m knew to the health world and I was a little hesitant but these are amazing! One question, mine were very crumbly. Is there a way to prevent that when I make them next? Hi! Did you use homemade almond butter or a creamy kind with just almonds? I had the same issue with them being crumbly. Do you think using 2 eggs instead would work? I love the flavor of them but they fall apart easily. I used a very running almond butter from Trader Joe’s to make these so perhaps that’s why they turned out so well every time I made them. I think perhaps you could use two eggs and have them turn out fine though if you’re having issues with the texture! We just finished making these! I used half almond butter and half sun butter and then used andes mint chips instead of regular chocolate chips. I think the runny sun butter made mine flatten out a little but they are still delicious! I’ve never seen runny almond butter … does it have oil in it? I just made these for the first time and they are INCREDIBLE!! The only major modification I made was adding half the coconut sugar and I was pleasantly surprised that they are plenty sweet without the other 1/4 cup 🙂 I also ended up adding a few splashes of almond milk (I think my almond butter wasn’t well mixed and therefore a little too dry). I used 1 tbsp to measure out each cookie and they still turned out perfect. Thank you so much for the recipe! I’m sure it’s going to be used many more times in the future! 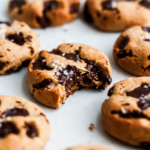 Hello I was just getting ready to make these cookies, can I use semi sweet instead of dark chocolate chips ? Thankfully I baked just one first, and was able to alter the recipe in time. It was so crumbly and dry, it was a bit like sawdust. (My almond butter was not runny at all, and it was pure almonds.) I added an extra egg and a few tablespoons of honey, hoping to get some moisture, and that helped considerably.I wouldn’t call them fabulous, but a good cookie if you’re Paleo or the full GAPS diet. The cookie start to crumble falling apart as you eat them , also they have a very strong taste. Not great for kids or parties. I will not make these again . These taste incredible! I subbed Xylitol sweetener for the coconut sugar for less calories and carbs and used Aldi’s almond butter. Texture was soft and crumbly, but improved somewhat after cooling and I didn’t mind since they were so delicious! I plan making these again. Thanks for a great recipe! These are fabulous, and as quick and easy as advertised. I’m about to make them again with peanut butter, because I used up all my almond butter. They are very crumbly, but I put them in the freezer and ate them slightly thawed- worked perfectly. I try not to keep chocolate chips in the house because I will eat them by the handful. 🙂 But I made these (without the chips) in a chocolate craving three days ago and again today for 4th of July celebrations! SO GOOD. After reading all the comments about crumbly cookies, I used my best judgment with the texture and ended up adding about an extra 2 TBSP of coconut oil to the mixture since my “pure” almond butter was still rather dry. They came out perfect. Soft to be sure, but that’s what I love about them. I get more of the almond butter taste up front but they linger with the deepest chocolatey fudge taste. Excellent. Thanks for my new go-to Paleo treat! I'm your follower now on! We made these tonight and they’re INCREDIBLE!!! Super soft and chewy…soooo good! I added pecan pieces to them as well for a bit of crunch! Amazing! I’m so glad you enjoyed them 🙂 The pecan pieces sound delicious. Followed the recipe but mine still turned out crumbly but yummy. Second time, I used 6tbsp light colored maple syrup(not a strong maple flavor) instead of coconut sugar and they were PERFECT!!! I’m glad that swap worked out for you! Enjoy!! PLEASE make a book with your fav recipes! I’d love to have a paper version of all your recipes! So happy to hear that! Love when the kiddos enjoy them 🙂 And I HOPE in the future! Stay tuned! These are amazing! I used ghee instead of coconut oil and a flax egg, and omitted the chips. They are crumbly, but in the most tender, delicious way! Yes!! Glad you liked them! My family and I love your recipes. Thank you for sharing them with us. Would it work to replace unsweetened cocoa powder with cacao? Thanks Cathy! So glad you all enjoy them 🙂 Cacao should work in here! Tried once, was awful. So strong the chocolate taste. Did it again with haf of the cocoa measured plus some orange juice and it was better. Strange that the chocolate was overpowering the first time around – I’ve never had that issue. Glad you found a swap that worked for you! Strange! It could be the oil content in your almond butter? I’m not 100% sure. So happy to hear that! One of my fav cookies 🙂 Glad you enjoyed! I made these today. They are awesome. Also o felt satisfied with a couple of cookies. No sugar spike. I am going to try topping with crushed pecans or hazelnuts next time. I’m glad you liked these! You’re totally right – these are perfect for curbing that sweet tooth without the sugar spike. Crushed nuts sound delicious! I just made a double batch of these. I left out the coconut oil, used 3/4 cup brown sugar, and 1 cup chocolate chips. I used regular organic eggs and only had 1/3 cup cocoa powder left, and they are so fudgy and delicious!! I ground a little sea salt on each and that is the perfect finish. MMMMMMMM!!! I’m glad those swaps worked out for you! Such a great healthy treat. Can I substitute the eggs for flax eggs? Would it work? I made these this morning with crunchy almond butter and they are unbelievable. Best chocolate cookie! So sorry! You are right, the recipe was incorrectly written and the baking soda amount is now updated. These are delicious! Made them with sunflower seed butter and they were sooooo good! Mmmm these were SO GOOD!! Like fudgy brownies!! 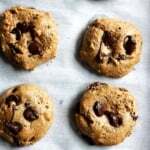 This is the best cookie recipe ever and believe me this not my first rodeo! Amazing!! So happy to hear that. Hi. These cookies sound amazing. Can they be freezed after cooking? I made these yesterday for my family and they were amazing!! I used a very runny nut butter (with shredded coconut mixed in) and 1/4 of honey instead of coconut sugar (didn’t have it at the time) and they still turned out super fudgey and delicious. I will definitely be making these again soon! I have never left a recipe reply/review before, but I don’t think I can help it. These are easily the best cookies I have ever made. I used 3/4 cup almond butter with 1/4 cup peanut butter. I also substituted 1/3 cup maple syrup since I didn’t have coconut sugar. Then, because the mixture was a bit runny, I added some coconut flour to thicken it. I enjoyed my cookies with a glass of unsweetened almond milk and a smile on my face 🙂 Thank you for such a delicious (and adaptable) recipe!